This page attempts to record what is known about the origin and history of the origami design known as the Pipe Cap / Bishop's Mitre napkin fold / Traditional Ingot. Please contact me if you know any of this information is incorrect or if you have any other information that should be added. Thank you. Diagrams for this design, called the Mitre and folded from a napkin, first appear in 'The practical housewife, forming a complete Encyclopedia of domestic economy" by R. K. Philp which was published in London by Ward & Lock in 1855. My thanks to Joan Sallas for this reference. The same design, this time folded from a 1:3 sheet of paper, appears in ''De Kleine Papierwerkers', which was written by Elise Van Calcar and published by K H Schadd in Amsterdam in 1863. 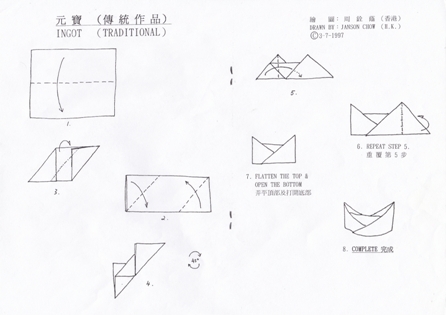 In 1997 the Hong Kong Origami Society published diagrams drawn by Janson Chow which presented what was essentially the same design as a Yuan Bao or folded paper version of a traditional gold ingot. When folded from a napkin, the modern version of this design is usually called the Bishop's Mitre.